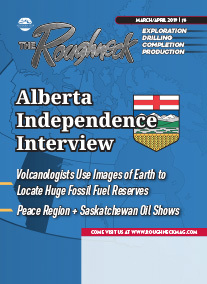 The Roughneck was founded in 1952 as the voice of the Canadian oil community. The magazine reports on the people and events of that community - both past and present - that have made the oilpatch in Canada what it is today. The Roughneck analyzes political events that affect the industry and profiles people and businesses that are a part of it. The magazine covers the news that others miss because it is a part of the industry about which it writes. Opinions expressed herein are those of the staff writers and may not reflect those of the magazine's readers or advertisers. "You’re open to talk about the mechanics of Alberta independence, and that’s where I’d like to focus but, just as an introduction, how likely do you think Alberta's independence is?"